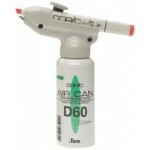 Air Can Only - ABS 2 - Compressor attachment plus air can - For use with Copic markers ..
Air Can only - ABS IN - Compressor attachment plus air can - For use with Copic markers ..
Starter Set - ABS 2 - Compressor attachment plus air can - For use with Copic markers ..
Starter Set - ABS IN - Compressor attachment plus air can - For use with Copic markers .. Single Colours for Copic Ciao Marker. See the Colour Chart here and select from the Colour Options to request individual colours. A number of product records are required to show the full range of colours. . Ciao Markers offer all the features of our Sketch Marker, but i.. Single Colours Copic Ciao Marker. See the Colour Chart here and select from the Colour Options to request individual colours. A number of product records are required to show the full range of colours. . Ciao Markers offer all the features of our Sketch Marker, but in an .. Single Colours Copic Ciao Marker. See the Colour Chart here and select from the Colour Options to request individual colours. A number of product records are required to show the full range of colours. . Ciao Markers offer all the features of our Sketch Marker, but in an econo.. Single Colours Copic Ciao Marker. See the Colour Chart here and select from the Colour Options to request individual colours. 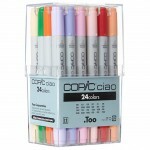 A number of product records are required to show the full range of colours. . Ciao Markers offer all the features of our Sketch Marker, but i..
Copic Ciao Double Ended Chisel and Brush Marker. Set of 12 Colours . See the full Colour Chart here . Includes basic, primary colours. 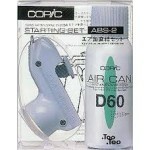 For colouring the portraits or manga characters, we recommend you to purchase some colours with skin tone additionally. ..
Copic Ciao Double Ended Chisel and Brush Marker. Set of 24 colours . See the full Colour Chart here . A well-balanced 24 colours set for beginners starting illustrations with Copic markers. ..
Copic Ciao Double Ended Chisel and Brush Marker. Set of 36 colours . See the full Colour Chart here . This set of vivid colours contains a variety of greens and purples. ..
Copic Ciao Double Ended Chisel and Brush Marker. Set of 72 colours . See the full Colour Chart here . A combination of 36 Colour Set A and B. Recommended for everybody from beginners to experts. .. Single Colours Copic Sketch Marker. 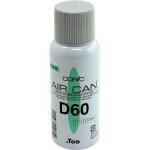 Download the Colour Chart here Oval body profile is roll resistant on working surfaces. Durable polyester nibs come in Medium Broad and Super Brush - a soft, flexible, fast-flowing brush for delicate or bold expression. Available in 358 colours and refillable ..
Set of 12 colours . See the full Colour Chart here . 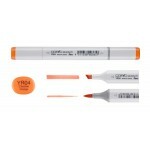 Copic Markers are the original line of high quality illustrating tools used for decades by professionals around the world. 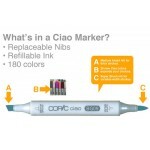 Available in 358 colours, the Copic Marker style has nine replaceable nibs and refillable ink. . This ..
Set of 24 colours . 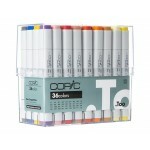 Copic Markers are the original line of high quality illustrating tools used for decades by professionals around the world. 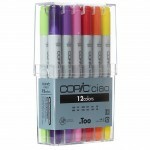 Available in 358 colours, the Copic Marker style has nine replaceable nibs and refillable ink. . A very useful collection for colouring s..